It took a breathtaking span of 26 hours in London for more records to fall in the thriving global art market. Works by Gerhard Richter, Lucio Fontana, and Cy Twombly were among those that set the pace at the post-war and contemporary art sales hosted by Christie’s and Sotheby’s. The highest priced lot took place on Tuesday when Richter’sAbstraktes Bild surprised the packed auction room on Bond Street with aggressive phone bids coming in at 2 million British pound increments ($3.1m). 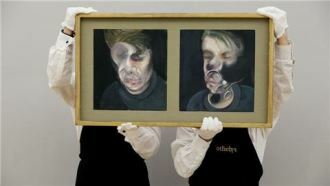 The final sale price of 30.4 million pounds ($46.8m) established a new auction record by a living European artist. “I think I can genuinely say it went to someone who truly wanted this painting, and he was set on buying it tonight,” Westphal said, noting Richter also happened to be her favourite artist. Eric Clapton in 2012 for a then-record of 21 million pounds ($32m). The artwork, which measures 3 x 2.5 metres draped with jagged lines of reds and greens, was last sold on auction at Sotheby’s in 1999 for $607,500, generating a return of 32.4 percent annually. “There are plenty of ultra-high net worth collectors who are willing to pay for top works. Works by another European artist, Francis Bacon, failed to make headlines this auction season, despite drumming up a buzz prior to the sales.